Tonight on the eve of Purim, I will gather 10 beloved women around me and recite Birkat HaGomeil (a prayer said in gratitude after one has overcome a dangerous or life-threatening event). In this blessing, I will hold close to me the hundreds of other women who were with me last Friday on Rosh Chodesh at the Western Wall (the Kotel). 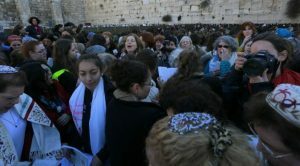 Women from across the religious (and secular) spectrum – Reform, Conservative, Orthodox, and ultra-Orthodox – flooded the Kotel, each driven by her own motivations and stances.